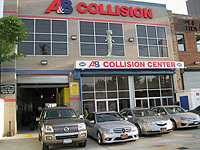 Since 1946, A&B Collision Center has served as one of the oldest and largest auto collision shops in North Staten Island. We have experienced phenomenal growth year after year through a sustained and focused commitment to quality and customer service, and we take great pride in providing honest, fast repairs for our customers. Due to this, our shop has attracted top technicians and skilled craftsman who strive for perfection, which is the goal we look to accomplish every day, regardless of whether we’re doing car paint repairs or auto body work. 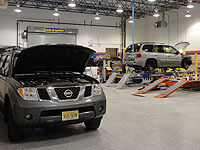 Our three auto collision shops in Staten Island and Matawan, NJ also feature state of the art equipment, and our staff is certified by The Inter-Industry Conference on Auto Collision Repair (I-CAR) and ASE. We also ensure that each member of our office staff is fully trained with the CCC estimating program. 120 cars a week capability. Customers never want to be reminded that their car was in an accident, which is why we utilize a high quality paint refinishing system and down-draft spray booth during car paint repair services. 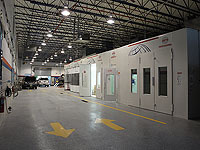 We have a total of four spray booths and four prep stations, ensuring that we can get your vehicle sanded, primed, and sealed for paint with very little downtime. Our systems are constantly being updated as well to correspond with each new finish provided by manufacturers and to ensure the perfect color match every time. After painting, a clear coat is applied to provide durability and a long-lasting, high gloss finish. We are dedicated to clients who appreciate the value of quality and convenience. This is why the staff at our auto collision shops in Staten Island, NY and Matawan, NJ is trained to handle insurance claims, rental arrangements, pick up/drop off service and 24-hour towing. We are also trained in CCC pathways and can offer a lifetime warranty on specific repairs. Through all of this, we hope to provide clarity in the repair explanation process and assist with all insurance and out-of-pocket expense claims. 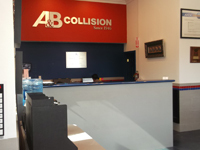 For more information about A&B Collision Center and the variety of auto body services we provide at each of our three locations in Staten Island and Matawan, NJ, contact us today.